Unfortunately, due to sales rights restrictions, we cannot offer Zemke's Wolfpack for sale in your country. The only US 8th Army Air Force fighter group to retain the mighty P-47 Thunderbolt throughout its combat tour in the European Theatre of Operations, the 56th Fighter Group justified its nickname of 'Zemke’s Wolfpack' by the aggressive attitude and tactics instilled by its original wartime commander Hub Zemke. This attitude continued through to VE-Day under the auspices of his successors Dave Schilling and Lucian Dade, and it became the top scoring 8th Air Force group for victories in air-air combat. Justifiably considered one of the greatest tacticians and leaders in VIII Fighter Command, Zemke’s leadership engendered an esprit de corps that was second to none. 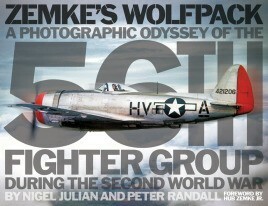 Looking beyond the Thunderbolt flightline, the authors have delved deep into their own extensive collections, along with the 56th Fighter Group museum archives and the many private photograph albums, made available to them by veterans and veteran’s families, in order to produce the most in-depth photographic record of the Wolfpack and its associated service units published to date. More than 400 photographs, the majority of which are previously unpublished, show views from behind the scenes alongside newly discovered aircraft noseart, social events, maintenance and repairs which, together with detailed captions, make this a visual and information feast. The modern day legacy is recorded with a section depicting memorials to the 56th Fighter Group. A full honour roll of those who made the ultimate sacrifice is included along with details of all confirmed claims by the Group’s air-air 'Aces'. There is much for modellers and historians alike… and if one hankers for the full story behind the subject one is building, this is the perfect book. They have produced a masterpiece. Being a soppy old sod at heart I feel I can allow myself the use of an awesome on this occasion. It is a word never knowingly overused in our world of reviews and we pride ourselves in keeping such descriptive hype off your screen. But every now and again something comes along that makes the adjective perfect for the moment. Awesome! Go get. This is a goldmine of information, of memories and detail for the modeller. A fine tribute to a group or airmen in WW2 and clearly the work of two authors who have a particular passion for the history of 'Zemke's Wolfpack'. The photographs are as fascinating as the stories of the ground crew, trainers and pilots are unique. With a foreword by the son of the eponymous colonel himself, Zemke's Wolfpack charts the day-to-day of the 56th in more than 400 captioned photographs drawn from archives and rare personal collections. The photographs are as fascinating as the stories of the ground crew, trainers and pilots are unique. These kind of books score outside the box; 6 stars out of 5!